Elite Exteriors has been installing seamless vinyl siding since 1995—back when it was the newest thing in home improvement. And now, more than 20 years later, we’re still committed to providing our customers with the highest quality vinyl siding products that incorporate the latest technology. We are proud to offer our customers Mitten seamless vinyl siding, one of the most durable and beautifully crafted cladding products on the market. 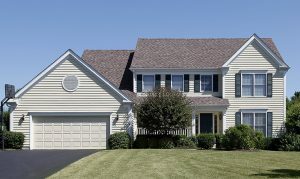 In addition to Mitten siding, we offer Mastic vinyl house siding. Beautiful, durable, and low maintenance, this vinyl cladding is backed by a fade/distortion warranty thanks to unique, patent-pending reflective technology. In addition to seamless vinyl siding, we offer “hard board” fiber cement siding from trusted names like James Hardie® and LP®. Fiber cement is the most durable and hail-resistant type of house siding we offer, and, like our vinyl siding, it is beautifully finished to look and feel like real wood. Elite Exteriors is your one-stop-shop for siding installation and repair in the Omaha area. There’s no job too big or small for our highly trained professionals. Whether you’re looking to revamp your home with completely new siding, or just make some repairs to areas that have been damaged by hail, wind, or other extreme weather, our team is ready to get the job done right. Elite Exteriors—big or small, we’re the ones to call. For more information on seamless vinyl or fiber cement siding, contact Elite Exteriors today, or visit our beautiful showroom in west Omaha to explore samples of our many product offerings.